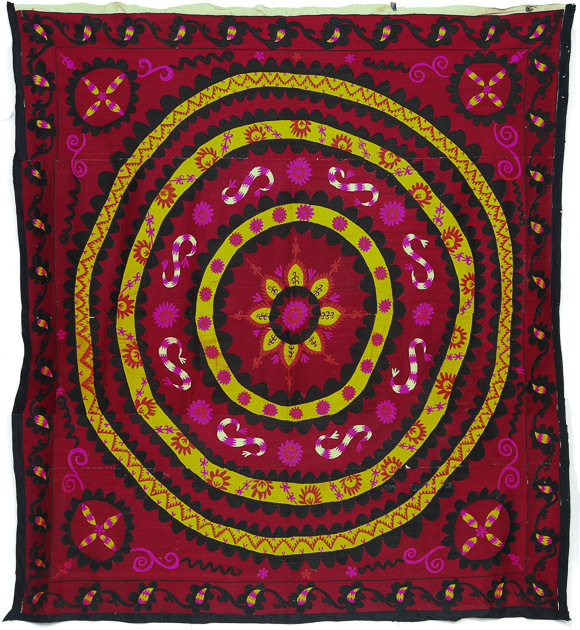 Suzani is a common term for embroidered dowry pieces (coverlets for the bridal bed, but also for made to decorate horses, tables, walls) produced for hundreds of years by the nomadic and settled women of Central Asia. Its roots are believed to be in the Fergana Valley that spreads across eastern Uzbekistan, Kyrgyzstan and Tajikistan. Way back in the first millennium, the silk roads passed this way, through forbidding mountains, deserts and steppes, arriving at Bukhara, Samarkand and Khiva, celebrated centres of trade and cultural confluence. From the fertile soil of this verdant valley grew cotton and mulberry for the production of high-quality silk. 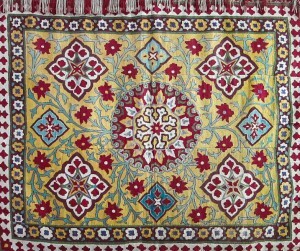 With the lush silks of the region, Uzbek women created exquisitely embroidered suzanis in different shapes and patterns to decorate their homes, to cover their belongings and most significantly, to tell the story of their lives, from birth to that all important rite of passage, marriage. 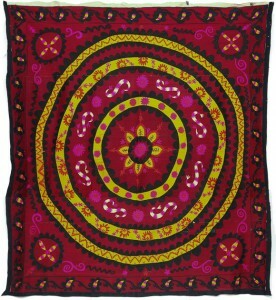 The suzani is an enduring symbol of cultural connections forged along the silk routes. 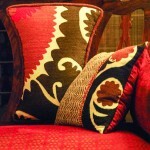 Its diverse yet distinctive motifs and designs trace influences from the Hellenistic, Persian, and Turkish worlds. 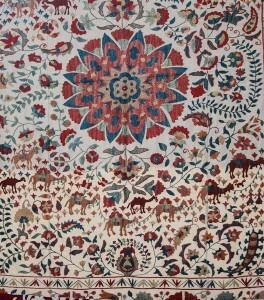 Suzani, in Persian or Farsi, means ‘needlework’. The fact that a Persian word is used to describe the embroidery of Central Asia is indeed the most telling sign of deep and lasting linkages made along those highways of antiquity. But there’s more to the suzani than its significant place in history. 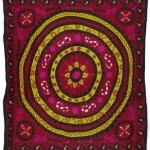 The making of a suzani is a fascinating archive of the private and communal lives of the tribal women of Central Asia. According to local custom, a suzani was started every time a girl was born, in preparation for her dowry. 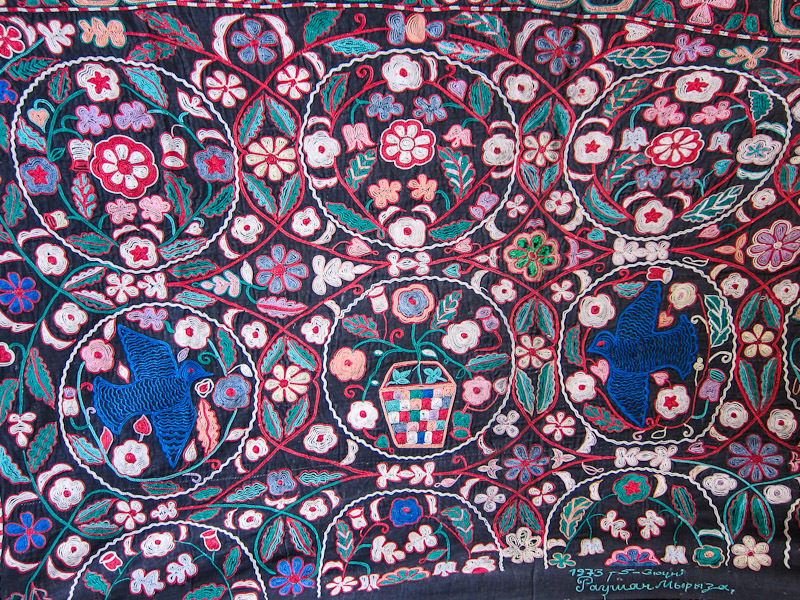 Panels of cloth were hand-woven and taken to a kalamkash, an older woman acting as the local designer. Each female family member took up embroidery of a separate panel, with hand-spun silk thread worked in chain, satin and buttonhole stitch. As soon as the bride-to-be was old enough, she too took up the work. Once the panels were complete, they were stitched together and handed over at marriage. With so many women participating in its creation, the suzani became a form of artistic expression, a way to communicate with the world outside. In the design would appear a tree of life, a fanciful garden, stylised pomegranates symbolising abundance and fertility, brightly coloured tulips and carnations on a vast desert-like brown field… everyday objects like the humble ewer … the evil eye. Colours, although pre-determined, were separately dyed and their use was never quite uniform… some used brighter, more cheerful shades perhaps reflecting a happy disposition, while others worked with darker, more brooding hues, possibly the outcome of not so happy times. Once the panels were complete and sewn together, the suzani was invariably slightly mismatched, ever so intriguingly whimsical. Here lies the uniqueness of the suzani. In its asymmetry, in its inconsistencies, in its delightful flaws lies its beauty… one work of art interpreted through the imagination of many women. The workmanship of a suzani was considered the litmus test of a bride’s industriousness and skill. Here again, is a wonderful insight. Embroidered into almost every suzani is an intentional “mistake”. It is believed only God can create what is perfect. Man cannot be so presumptuous as to attempt it. So, look carefully at an old suzani and you will invariably find an incomplete pattern, a distorted motif, that deliberate error of humility. For the most part, you can tell where a suzani is made from the patterning, base fabric and colour of threads. Regardless of its place of origin, the first thing that always strikes you about a suzani is the distinctive central roundel, known as the palak or a gul. A palak is a heavenly orb, often stylized to look like giant red flowers. It appears not only among the Central Asian nomads, but also in the embroideries of Rajasthan and Gujarat, in Kashmir and in Turkish-influenced pieces from the Balkans, and in all of these places it is a symbol of power and fertility. Very broadly, suzanis from Bukhara are made on a silk-satin cream base, featuring large floral and vine patterns and motifs. 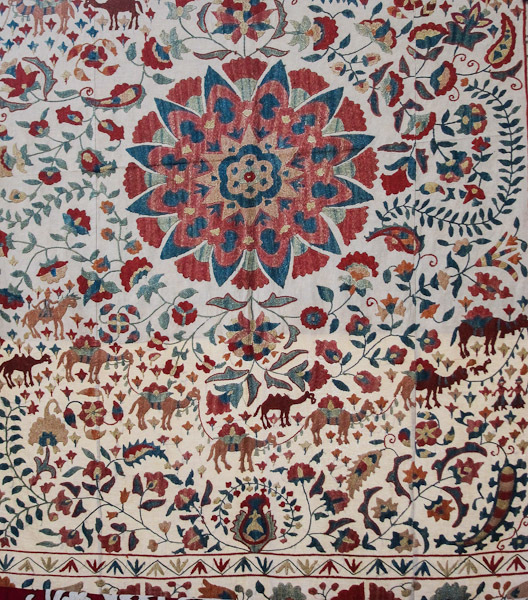 Tashkent suzanis tend to have brightly coloured backgrounds and fairly small stylized floral motifs, whilst Fergana Valley work features large bold motifs – usually black and red on a cream background. Unlike so much that flourished along the silk roads and disappeared with its decline, the suzani has endured. I believe one of the main reasons it has survived is because of its inclusive nature. 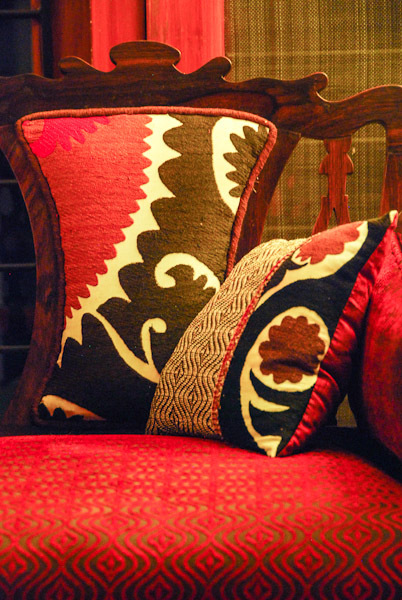 The suzani has evolved with time, embracing new ideas, new markets… change. 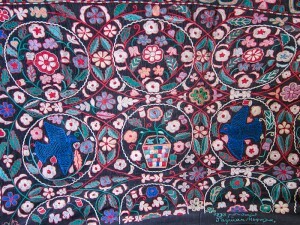 Most of the Uzbek suzanis you see today are still hand worked but no longer dowry pieces. They are made to be exported around the world. 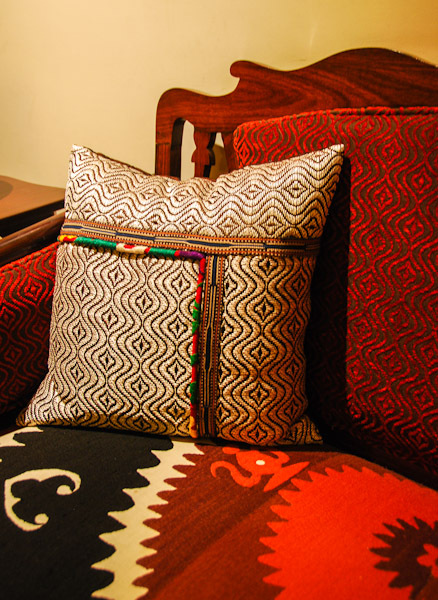 We visited Bukhara’s largest suzani exporter who sends all his pieces to Istanbul. It appears suzanis are more plentiful in the famous Grand Bazaar than they are in Uzbekistan! Thanks to Arastan, I now possess some beautiful suzanis. My first instinct was to frame my acquisitions, preserve them. But that I realised would be doing injustice to these embroidered treasures… in framing them, I would be foreclosing their stories. The more I thought about them, the more I knew that, as a woman in my world, I needed to keep the suzani legacy alive. Not treat it as a trophy, but see it as an opportunity for creative interpretation. And that’s exactly what I did. I cut and sewed and tucked and added more fabric to, in many ways, create suzanis of my own. 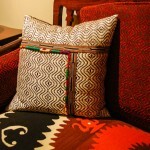 I integrated them into my home as a tribute to those brave and creative women of Central Asia. Here are some images of my suzani love story. 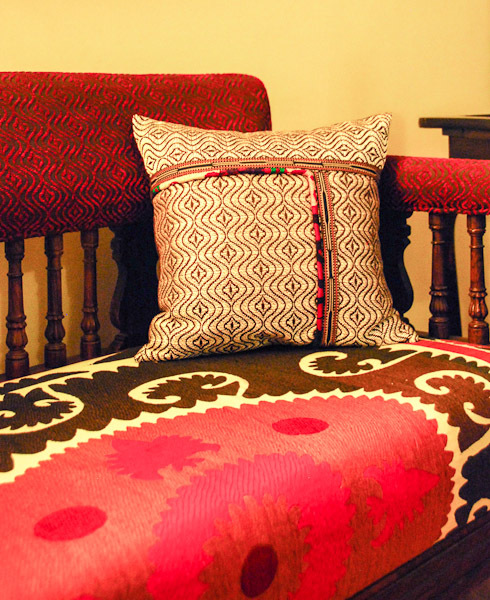 If you are equally enthralled, do visit Arastan and allow the beautiful suzani to tell another story through you. 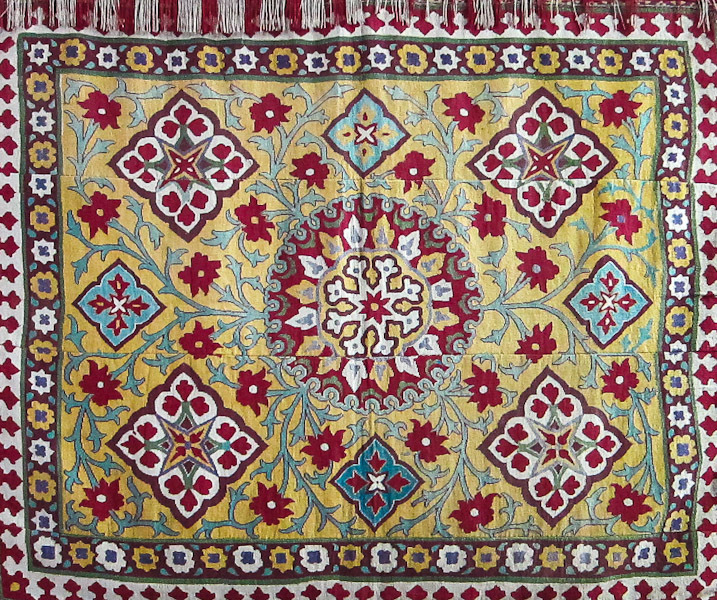 This entry was posted in Craft Heritage, Uzbekistan and tagged bukhara, khiva, samarkand, silk road, suzanis, uzbekistan. Bookmark the permalink. Both comments and trackbacks are currently closed. I am a guy living in Teheran and i have to inform you that reading your weblog is truly a pleasure. i got many useful information from you travels and really felt like being with you during your journeys. you have become one of my favorites and will visit your blog frequently. Especially liked your explanations about Suzani to which i am very interested and also planning my journey to Tajikistan and if possible to Uzbekistan. Since you mentioned that you meet with the largest Suzani exporter in Bukhara , i would highly appreciate if you could provide me with his contact info or any provider of Suzani’s from Uzbekistan. 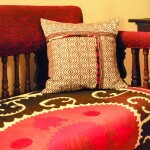 Arastan has recently produced a range of one-off suzani-based furniture, now available from our online store. We now also have a fine selection of authentic suzanis in the Arastan online store, primarily from Uzbekistan but also including some from Tajikistan and Kazakhstan.